On the ground floor of the mixed-use May & Ellis apartment building (formerly the Hurwitz Mintz building) behind a row of French doors, one can get a glimpse of hot pink neon and cane-bottom dining chairs, an unusual combination for a Parisian brasserie. But in the historic French Quarter, it’s a perfect fit. 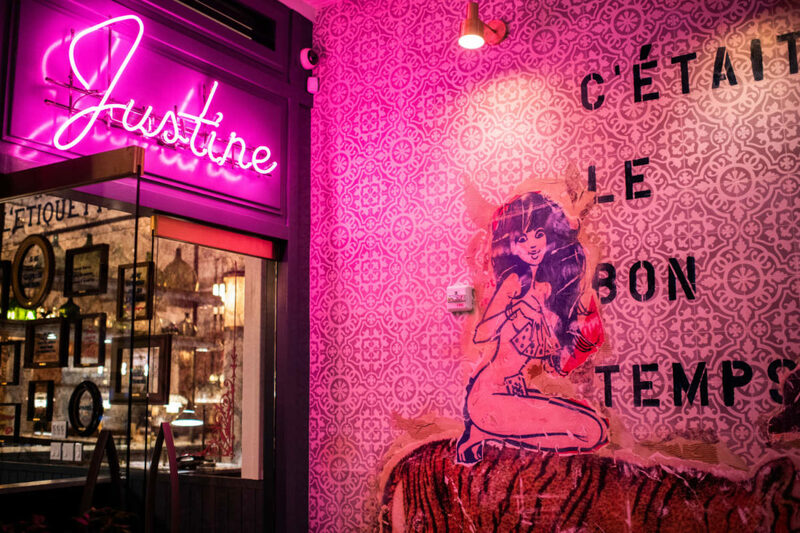 Justine is the third restaurant from James Beard award-winning chef Justin Devillier and his wife Mia — an elegant and funky addition to the family of restaurants that includes Uptown’s La Petite Grocery and Balise Tavern in the Warehouse District. The Devilliers tapped local architecture and interior design firm Farouki Farouki to transform the long, narrow space into a dynamic, unique and captivating brasserie, and they succeeded above and beyond expectations. “To achieve the level of intimacy we desired, we needed to break it down into several different spaces,” says Caroline Farouki, who co-founded the firm with her husband, Sabri. “It forced us to create different environments, which, in the end, is what makes Justine so special.” From the casual sidewalk-cafe feel in front to the more formal and romantic bar room toward the back, the restaurant offers differing atmospheres to please the changing whims of its patrons. Aside from the restaurant’s problematic dimensions, Farouki Farouki was also forced to work around a suspended ceiling that had been installed by the building’s landlord for acoustical attenuation between the eatery and the tenants living above it. “We couldn’t penetrate [the suspended ceiling], and we couldn’t hang anything weighing more than five pounds from it,” Caroline says. Most of the lighting throughout the space is at sconce level or lower, from tape lights to table lamps. “I think that was actually a great learning lesson to realize that this [lighting scheme] created an incredible ambiance,” she adds. The Faroukis traveled to Paris with the ownership team to research the design of classic French brasseries, and, of course, to shop for items to put in the new restaurant. One such item is a butcher shop marquee, currently hanging above the kitchen window in Justine. In keeping with that theme, Justin also discovered a mounted cow’s head at one of the many flea markets they visited. 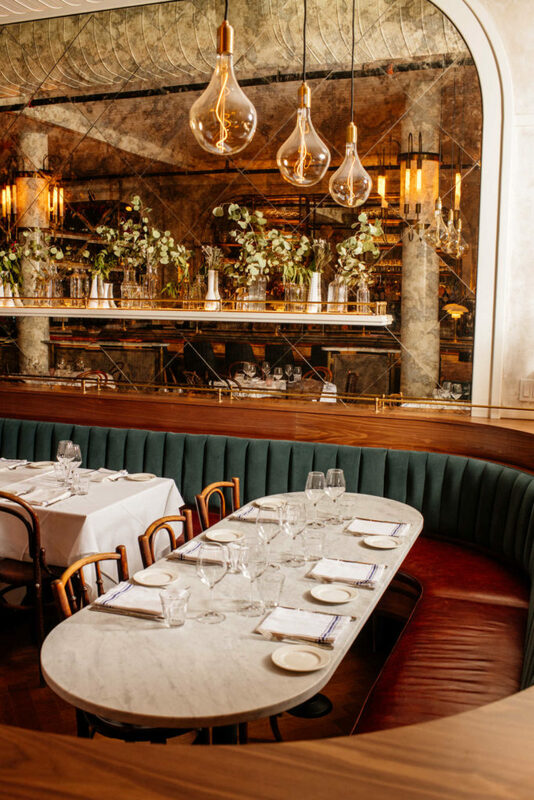 “Further on in the design, we knew we wanted it to go above that particular banquette, but the scale was too small,” Caroline says. “We were thinking about cow competitions in France and how when a cow wins best in show, they drape what’s basically like a floral lei around their neck.” To beef-up the scale, the team designed a floral wreath that was executed by Mitch’s Flowers on Magazine Street. Then, in keeping with their over-the-top design, they ringed the mounted head in pink neon. Aside from the floral wreath, Farouki Farouki worked with a number of local artisans to create the gorgeous and imaginative space. The French-inspired, herring bone wood floors were created by Vision Wood; the custom-designed terrazzo, a common, yet beloved characteristic of many New Orleans’ environments, was installed by Terrazzo Masters out of Metairie; the millwork company Construct executed the design for the brass shelving behind the bar, plus all of the restaurant’s banquettes and cabinetry; and E. Kraemer Fine Metal & Woodwork fabricated all of the custom lighting. From the girl riding a tiger in the sidewalk cafe to the colorful city map murals in the back, Justine’s art was led by two very distinct teams. The first team, led by local artist Ellen Macomber, was selected by the Devilliers themselves. “Mia and Justin were at Jazz Fest and saw this mural and were like, ‘We want this in the back room,’” Caroline says. The blue mural was a piece done originally by Macomber for the tricentennial celebration at the New Orleans Jazz & Heritage Festival in 2018. To balance the room, and the dual design of the entire restaurant, Macomber collaborated with a French artist to create the pink Paris mural on the opposite wall.